Cuomo probably wanting to show how "tough" he is to voters outside New York. He has had 8 years to do this and has done nothing so allow me to take this with a huge grain of salt. Blow up the MTA... Yeah - How about we start with Cuomo himself ! Something within the MTA has to change, that is very clear. But I don't think Cuomo is the guy to do it. It is clear he doesn't understand much, and he seems to be very Trump-ian in his actions. That sort of grandstanding, the last-minute decisons and interferences, and his very clear political aspirations is not what the MTA needs. Yes, he's our own little mini-Trump. Gosh Governor, could the issues with contract pricing and timeline be in part related to the fact that important projects get completely changed just before construction? Seriously, though. The MTA could use some restructuring from a redundancy standpoint (why do we have 2 railroads; why do agencies get their own legal dept's, etc) and from a funding standpoint (stable funding = lower debt service costs, cleaner ops, lower cap costs) but what is really needed is a culture change. Management is the root of the issue, here, and that won't change until the people change, regardless of the structure in which you encase it. You ever read something you agree 100% with but wanna disagree cuz you dislike the MF that said it? How I got involved, actually, uh, the vignette is, I was going through the campaign and I was in Brooklyn towards the end of the campaign, and a gentleman came up to me in Brooklyn and was very animated and came up to me and pulled the lapel of my jacket—I was wearing a suit—and went on at length about his dismay on the L train and it was gonna hurt his business, and this was a real catastrophe," Cuomo explained. I had heard complaints before but, I mean he was really vociferous, he was very angry slash irate, and he said, "Have you checked into this?" And I said, well the MTA’s doing it and the MTA has these great firms and all the experts and I’m not really an expert and I’m not an engineer, I don’t really know. And he said, "Well will you look me in the eye and tell me this is the best plan?" I said I’ll look you in the eye and tell you that all the experts say this is best plan, but I don’t know enough to tell you that I believe it. He said but they told you that you couldn't build a new bridge at the Tappan Zee, didn’t they? I said yes. He said, ‘but you did it, didn’t you?’ I said yes. He said well did you ever build a bridge before governor? I said no. ‘Well you figured that out, right? And you named the bridge for your father.’ I said yes, I was very proud to do that. He said, "Will you give me your word that you will check into this L train tunnel?" I said I will give you my word, I will check into the L train tunnel. He said "OK, I’m taking you at your word." I said I give you my word, I will check into the L train tunnel. And nobody heard this but me. And my security detail which was slightly alarmed, but they’re often slightly alarmed. That stuck with me after the campaign. To me, it sounds more like this one person AND a bunch of donors "strongly suggesting" Cuomo do something to block this shutdown. Cuomo has IMO been setting up for a 2020 Presidential bid and I still think this is all related to THAT. Except the one angry man doesn't exist... Both Cuomo and Trump use it as a metaphor. Oh it does no doubt, but I seriously doubt that was the ONLY reason. Yay, more grandstanding and posturing from the Prince himself. We should just start playing royal fanfare every time he speaks; something that befits his status of course. In all seriousness, will we see anything concrete from this or will we simply get another press conference that doesn't give a hint of the actual process involved? Forgive me if I'm not convinced he's all that serious on this. If this is all to get him votes for a potential presidential bid next year like everyone believes, wouldn't it make more sense to actually make some progress with all these goals rather than just talk about them all the damn time? While Cuomo does not have full control of the MTA, he does hold an important position in that he's the guy who appoints the chief in charge of the agency. If his end goal is purely to rein in spending, reduce redundancies and get the MTA back to where it needs to be, he can easily put someone in charge who can get all the sub-agencies to fall in line. Of course, he'll need to reach out to another group of experts first, so we might be waiting a while for that. NYC still owns the physical subway infrastructure and can take back full control at any time just by asserting its right to do so. However, that will never actually happen because that control would come with full responsibility (legal, financial, and political). NYC control of NYCT is a bad idea. Basically guarantees that there will never be commuter rail-NYCT fare/service integration, and that riders who commute from NYCT-land to the burbs get ignored. Transportation is a regional concern with local implications, not a local concern with regional implications. Which is why, at the risk of pulling a Wallyhorse, should be democratized to where the board should be made up of local politicians to it's service area - that way accountability isn't 3 hours away on the Thruway. NEW YORK (CBSNewYork) — Gov. Andrew Cuomo has upped the ante on fixing the city’s dysfunctional mass transit system. He now says it must be reorganized and that he should have total control. It will also mean more money from the city, CBS2’s Marcia Kramer reported Sunday. The governor’s name is Andrew M. Cuomo. He now wants the “M” to stand for Metropolitan Transportation Authority. To his budget director, Robert Mujica, Cuomo floated a proposal that would give him iron-fisted control over the troubled agency, flushing out what he has only hinted at before. “This year we have to take the bull by the horns with the MTA,” Cuomo said recently. “The governor will step up, even if not politically, in his own best interest,” Mujica said in a statement. The governor, who currently shares control of the agency with New York City Mayor Bill de Blasio and six county executives, also offered a revision to his funding plan for the $60 billion it is expected to take to fix buses and subways — congestion pricing with the city and state splitting any shortfall 50-50. “We have to pass a dedicated funding stream, so the MTA has the funding it needs. Congestion pricing is the only alternative,” Cuomo said. For his part, de Blasio in the past has rejected putting more city dollars into mass transit. During his state of the city speech he again called for the millionaire’s tax. Meanwhile, Council Speaker Corey Johnson said he’s trying to come up with his own plan to have the city take charge of the buses and subways. The governor is expected to have more to say on mass transit and a whole lot more issues on Tuesday during a speech in Albany. Also on Tuesday, the MTA has called an emergency board meeting to be briefed on the “L” train project. The meeting is open to the public. So he wants full control of the MTA, including presumably the agency's finances, but still also wants NYC to pay for half of it, all without any say whatsoever? Yeah, that sounds like a worthwhile plan not destined for failure at all. I do wish Andy Boy would stop acting like he's mankind's New York's savior with his harebrained schemes that don't amount to anything. It does get quite tiring after a while, doesn't it? While he does not presently hold full control of the agency, he does have the ability to be the driving force behind the MTA with who he places as chairman. He's been in office for eight years now and watched as the city's transit network collapsed at the seams all the while maintaining the position that he cannot do anything since he does not control the MTA and feuding with DeBlasio over said ownership. He's punted the issue for nearly a decade, and now that he's realized he has a chance to be president (I don't know who told him that by the way), he wants to swoop in and save the day. Forgive me if I'm skeptical here. Of course the Daily News asserts contractors have a 25% MTA surcharge for MTA bureaucracy; of course with no citation, and it is completely unheard of for a vendor to price gouge the client when they know they have an inescapable obligation. NYPOST- Gov. Andrew Cuomo may have been stoned when he proposed splitting the cost of fixing up the MTA with the city, Mayor Bill de Blasio implied Monday. “If anyone thinks that money can be found in the city budget they may be smoking marijuana,” Hizzoner said when asked about Cuomo’s Sunday proposal to take the reigns at the authority while going Dutch with the city on MTA capital costs. Cuomo’s appointed state budget honcho Robert Mujica argued Sunday that the “legislature should pass congestion pricing and require the City and State to split any funding shortfall and also give the Governor operational responsibility,” and Cuomo himself took up the argument Monday on the radio. De Blasio has argued that Cuomo “has had effective control for a long time,” because he appoints a plurality of MTA board members and can already veto the authority’s budget — but the mayor said he could get behind the power grab anyhow. Cuomo previously said the city should pick up half the tab for the MTA’s anticipated $37 billion Fast Forward modernization program. So the solution to the political problem of having one person "manage" the 's vision and operations is to give the one person legislatively authorized to "manage" the 's vision and operations legislative authorization to manage the 's vision and operations. Doesn't surprise me one bit. Cuomo probably is: He probably thinks he can actually become President and the impending shutdown likely to him and/or his donors would have ruined his chances. Cuomo may not realistically have a chance to win, but that likely won't stop him from throwing his hat into the ring. The MTA is ramming through Gov. Andrew Cuomo’s controversial plan to avert the L train shutdown, the authority announced Thursday — just two days after the agency’s board bashed the plan during a heated “emergency” meeting Tuesday. “[T]he total shutdown of both tunnels and all service scheduled for April 27 will not be necessary,” reads a statement issued by the MTA Thursday evening. An MTA insider said the announcement had Cuomo’s fingerprints all over it. The Canarsie tunnel carrying the L train from Brooklyn to Manhattan was scheduled to be closed for 15 months of post-Hurricane Sandy repairs, but Cuomo swooped in on Jan. 3 and announced the authority would instead shutter one tunnel at a time for piecemeal repair. 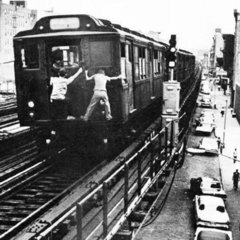 Then he pumped the brakes the next day and said the MTA board needed to approve the proposal. But the board picked apart the plan Tuesday over concerns the fix wouldn’t last as long as the initial plan — and would expose riders to carcinogenic silica dust. Cuomo has been arguing that he should be put in charge of the struggling agency, and the L train news came on the same day that he repeated his pitch on the radio. The MTA and governor’s office did not respond to a request for comment. The news came just hours after Cuomo once again argued on WNYC radio that he should be in charge of the struggling authority — which he already controls. Hours later, Cuomo’s MTA announced the end-run around its own board.